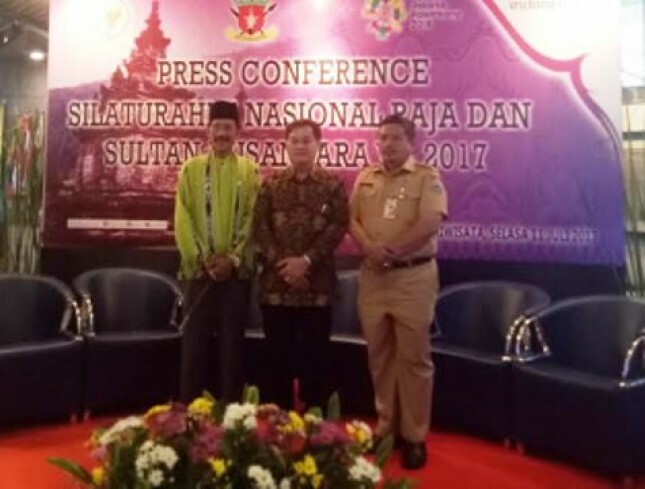 INDUSTRY.co.id - Jakarta- The National Hospitality of the King and Sultan Nusantara (Silatnas) to-V held by Forum Raja, Sultan, Datu and Ratu will be held at Nusantara Building of the House of Representatives of Jakarta on 27 to 30 July 2017. The implementation is based on the culture, history, customs in Indonesia will remain intertwined. "We have Silatnas do not want to politics, we are purely for civilization, customs, culture and history to be maintained and can be developed, and the cultural actors must be really united, that is our hope and sovereignty," said Secretary General of the Board (BP) Silatnas King and Sultan Nusantara, Upu Latu ML Benny Ahmad Samu-Samu as King Samu-Samu Van De Laatste Von Koning Stamboom, in a press conference at Sapta Pesona Building, Ministry of Tourism, Jakarta, Tuesday (11/7/2017). In the event of Silatnas ke-V in 2017, he continued, all the King, Queen, Sultan, heirs all gathered into one wearing custom clothing, all tribes gathered, language and from there we will introduce Indonesia. "Our aim is to bring together Kings, Sultans, Datuks, Queen, including the heirs of inventaeis from the first century to the 18th century. There are 732 works and sultanate," he said. In addition, from the Ministry of Tourism, Expert Staff Multicultural Ministry of Tourism, Hari Untoro Drajat, fully supports the implementation of Silatnas 2017. "There are 447 relics of historical fortress from the Netherlands and it makes Indonesia a scent in the world and by starting to preserve, development and utilization," he said. I would like to convey, He added that once the interest of the archipelago because of spices and history, but currently the tourism's superiority in cultural potential up to 60 percent. "We do not want to be a ruler, but We just want to be the successor to the traditional and cultural heritage in Indonesia," added Upu Latu M.L. Benny Ahmad Samu-Samu as King Samu-Samu Van De Laatste Von Koning Stamboom. This activity will be attended by about 600 participants consisting of King, Queen, Sultan, Datu including heir and successor to the kingdom and empire.